“Phil Kessel will score 40 goals with the Pittsburgh Penguins.” How many times have you heard that since the blockbuster trade on July 1st? It seems like a pretty safe guess. Kessel has scored at least 30 goals in five of his nine NHL seasons without a “generational talent” centering him. Put him next to Sidney Crosby or Evgeni Malkin and 40 goals doesn’t seem so difficult. But why stop at 40? The most common rebuttal to the possibility of Kessel scoring 50 goals has been an “adjustment period.” The same one James Neal went through before scoring 40 goals in the 2011-2012 season next to Evgeni Malkin. The only problem is, James Neal never had an adjustment period. 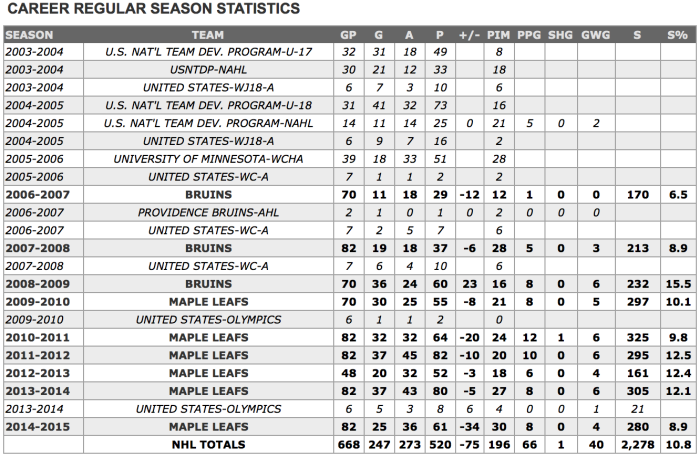 James Neal didn’t arrive in Pittsburgh as a terrible hockey player. He had hit 20 goals before and flirted with 30. But those first 20 games in a black and gold sweater were rough with Crosby and Malkin watching from the press box. He had absolutely no experience playing with an elite centerman. 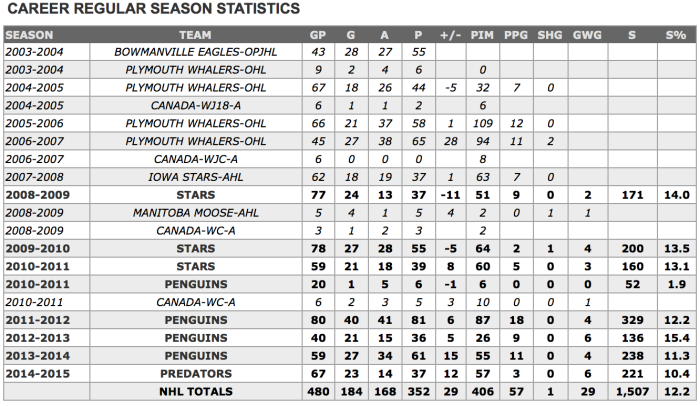 The next season he scored 40 goals alongside Evgeni Malkin. The only visible “adjustment period” is Neal scoring only two more goal his first season in Nashville than he did during the shortened 2012-2013 season. Again, that is just how Phil Kessel plays. It’s pure talent. The numbers do lend some support to the notion that Kessel is bad defensively and gives up a lot of high quality shots. However, to me the whole issue seems to be blown out of proportion and is probably more of a product of Toronto’s awful shot rates over the last few years. Kessel’s most frequent linemates of [Tyler] Bozak and [James Van Riemsdyk] don’t do better without him in any case. If we look at Kessel’s time in Boston, the shots against hextally with him on and off the ice is a lot better. Kessel did just fine playing with [Marc] Savard as his center, I’m 100% certain he’ll be just fine playing with Sidney Crosby or Evgeni Malkin. Don’t let buzzwords like “flashy” and “lazy” change your opinion either. If a “lazy” and “flashy” player has already totaled at least 80 points twice in his NHL career, he can be as “lazy” as he wants. There are great expectations surrounding Kessel’s first season with the Pittsburgh Penguins. But looking at his career as a whole, 50 goals doesn’t seem like the greatest of expectations after all.